Flame Retardant Silicone Flex Glass is made by compounding a high-grade fiberglass braided sleeving and a silicone rubber coat to shield all your cables and wires from cuts, internal abrasion, and severely high temperatures. The elastometric silicone rubber coat maintains acids, liquids, and most organic solvents out to prevent mechanical failure. 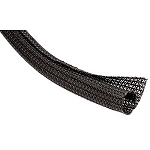 This silicone coated fiberglass braided sleeving resists extreme temperatures reaching 311F and also maintains its flexibility in low temperatures for easily installation. Grade A sleeving controls up to 7,000 volts and Grade C sleeving controls up to 2,500 volts safely and efficiently. The high dielectric strength on this silicone braided fiberglass sleeving makes it ideal for power supplies, wire harnesses, motor coil, heater leads, and appliance assemblies. Black, Natural, Red, and White are the 4 colors available for this cable protector. Use scissors or shears to cut custom dimensions for easy installation. For Bulk Spools of this Flame Retardant Silicone Flex Glass braided sleeving click here.